We understand Family Members of loved ones with Alzheimer’s disease and other related dementias go through some of the most difficult challenges in their lives. Experienced and compassionate help is available at Tallahassee Memory Care. We are dedicated to caring for people with Alzheimer’s disease and other types of memory impairments in a nurturing, residential environment. With our innovative Program, we create individualized care and service plans for our Residents with Alzheimer’s and other related dementias. Plans are based on their levels of need—which may increase over time as their needs evolve. Our Memory Care program is managed by a nurse, and our specially trained Team Members are available 24-hours a day, seven days a week, to provide comfort and security in a safe, familiar and stimulating environment. We also partner with a myriad of health care professionals to help provide the most innovative services for our Residents. Our Memory Care Program is rooted in a Resident-centered approach focused on creating feelings of belonging and purpose for residents. We seek to preserve their dignity and sense of self. This sound philosophy, life enrichment activities, and partnerships with health care professionals make our Memory Care Communities leaders in the communities we serve. We strive to keep our Residents engaged in life mentally, emotionally and physically. With positive reinforcement and a variety of effective programs, our goal is to enrich their lives. Independence is key to ensuring happiness and quality of life. Our Residents value their independence as it brings with it dignity, control, self-esteem, and fulfillment. We encourage independence as much as possible as it often creates a sense of achievement and pride in our Residents’ accomplishments. Taking control of certain aspects of their day-to-day tasks can not only lift the mood and outlook of a resident, but can also help improve his or her overall health and well-being. Our Memory Care Program’s holistic approach in caring for people with dementia is based on Eight Core Components. These proven components help support and comfort our Residents and enrich their daily lives. Many of our Residents need help with their personal care or activities of daily living. 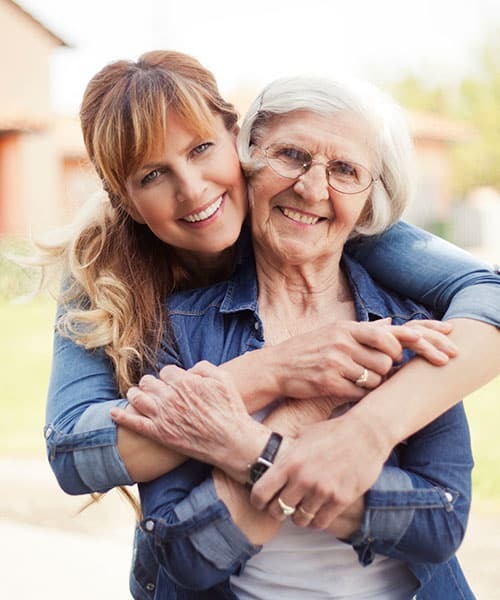 With warm smiles, gentle touches and encouraging words, we assist Residents with personal hygiene (bathing, grooming and oral care), dressing, eating, incontinence management and transferring such as moving from seated to standing and getting in and out of bed. Studies demonstrate that people with healthy connections and relationships have greater emotional well-being, live healthier lives, and have longer life expectancies. We encourage our Residents to participate in programs and activities that help them make those connections, stimulate socialization, and give them an enhanced sense of meaning, purpose, and belonging. Social hours, celebrations, barbecues, ice cream socials, and sharing stories are a few examples of our social activities that can create a sense of joy and purpose. Our compassionate Team Members support our Residents emotionally with companionship and affection. They strive to respect Residents’ feelings, compliment them, listen effectively, and speak with a kind tone. Having a good support network that Residents can turn to for encouragement helps them feel socially connected and gives them a sense of belonging and purpose. Leading a physically active lifestyle can have a significant impact on everyone’s well-being—including those with dementia. Exercise is beneficial for both physical and mental health and may improve the quality of life for people in all stages of their dementia. Physical activities can include walking, gardening or dancing, as well as sports and exercises with the aim to improve and build strength, fight depression and provide fun for our Residents. Research shows that cognitive stimulation can help slow the decline of dementia in its early stages. Our Program engages Residents in meaningful activities to stimulate cognitive function while addressing individual needs. Playing games, working with puzzles, or practical activities such as writing or folding laundry are some of the ways we help Residents engage their brains. Specially designed for people with dementia and related illnesses, our personalized, life-enrichment activities strive to maximize independence while focusing on individual strengths and abilities. Our Communities are set up for safely engaging in activities such as picnics in the courtyard, arts and crafts, walks through the courtyard, cards and games, and other opportunities that offer residents a variety of choices to be as active as they like. From book clubs to puzzles, trivia games to movies and much more, we strive to keep your loved one informed and engaged. Our goal is to provide a meaningful quality of life each day. Both art and music can provide powerful opportunities for connection for those with memory loss. We encourage artistic expression by offering residents opportunities to express themselves using a variety of mediums. Activities include crafts, decorative arts, and performing arts. Residents have opportunities to draw, paint, make easy-to-create crafts, dance and sing. Our Community also uses music therapy as one of the tools to help bring your loved one happy relaxation or provide toe-tapping fun. Eating a well-balanced, nutritious meal is important for overall health. We take pride in preparing well balanced entrées, from scratch, served table-side by our caring Team Members. Our dining program is designed to offer restaurant-style menu choices with regional and traditional cuisine in mind, served in an atmosphere that encourages independence. We welcome and encourage friends and family to join Residents in our dining experience. There’s no doubt that dealing with Alzheimer’s and dementia can be a difficult journey for Seniors and their Families. As dementia symptoms progress, our goal is to improve our Residents’ sense of well-being by providing emotional support and helping to maintain familiar activities and social contacts. This allows us to provide a nurturing atmosphere in which all Residents are encouraged to thrive—wherever they are in their dementia journey.